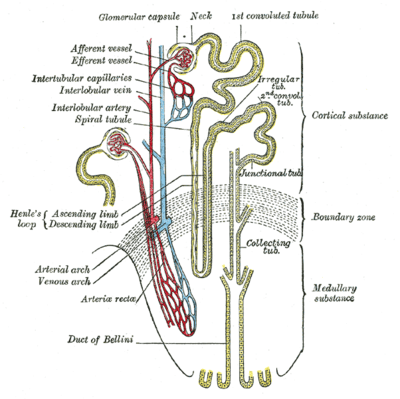 The collecting duct system of the kidney consists of a series of tubules and ducts that connect the nephrons to the ureter. It participates in electrolyte and fluid balance through reabsorption and excretion, processes regulated by the hormones aldosterone and vasopressin (antidiuretic hormone). 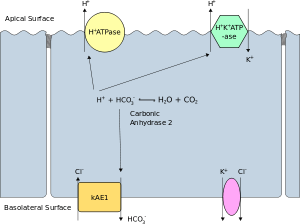 The principal cell mediates the collecting duct's influence on sodium and potassium balance via sodium channels and potassium channels located on the cell's apical membrane. Aldosterone determines expression of sodium channels. Increases in aldosterone increase expression of luminal sodium channels. Aldosterone also increases the number of Na⁺/K⁺-ATPase pumps :949 that allow increased sodium reabsorption and potassium secretion. :336 Vasopressin determines the expression of aquaporin channels that provide a physical pathway for water to pass through the principal cells. Together, aldosterone and vasopressin let the principal cell control the quantity of water that is reabsorbed. ↑ Boron, Walter F. (2005). Medical Physiology: A Cellular and Molecular Approach (updated ed.). Philadelphia: Elsevier/Saunders. ISBN 1-4160-2328-3. ↑ Physiology: 7/7ch03/7ch03p19 - Essentials of Human Physiology – "The Nephron: Collecting Duct"
1 2 Guyton, Arthur C.; John E. Hall (2006). Textbook of Medical Physiology (11 ed.). Philadelphia: Elsevier Saunders. ISBN 0-7216-0240-1. ↑ Schlatter, Eberhard; Schafer, James A. (1987). "Electrophysiological studies in principal cells of rat cortical collecting tubules ADH increases the apical membrane Na+-conductance". Pflügers Archiv European Journal of Physiology. 409: 81. doi:10.1007/BF00584753. 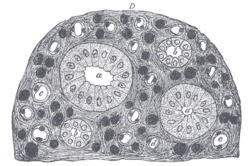 ↑ Physiology: 7/7ch07/7ch07p17 - Essentials of Human Physiology – "Intercalated Cells"